Haha, I was watching Gundam AGE Episode 47 and can’t help but notice this scene… It reminds me of Domon Kasshu doing the erupting burning finger move hahaha! Well, I did not say it is a rip-off, but you know Bandai/Sunrise, they love to reference a lot of stuff from old Gundam series. And it seems that this one is a tribute as well to God Gundam as done by the Gundam AGE-FX (or Domon to Kio). Share the photo if you like haha! 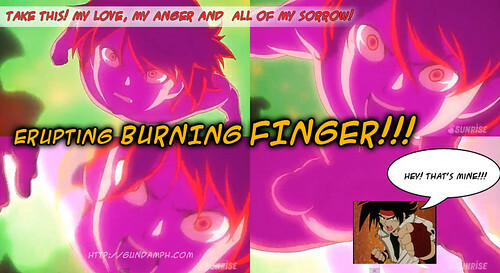 this is the true erupting burning finger!